How many of you no longer have a landline, and hence, a home number for others to reach you? Surely there would be a fair amount, but what about those who do own both a landline and a cell phone? Why, here is the perfect device to bridge both the old and the new in the form of the Cell Phone To Home Phone Redirector. 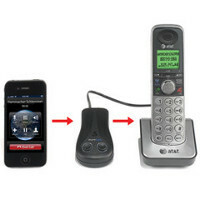 The name more or less explains its position – it is a device that can redirect calls made to a cell phone directly to a home phone handset. It takes less than a minute to set the entire shebang in your abode, where you will plug it into an existing home telephone while pairing it with a cell phone through Bluetooth connectivity. All incoming calls will then be sent straight to a home home up via the device, as long as it remains within a 30 foot radius. This works great for folks who prefer the comfort and familiarity of a home phone handset, or for others who have already done away with a landline service but still want to make use of the physical home phone instead of trashing it. The device can be paired up to a couple of cell phones, and for $59.95 a pop, it might just be what dad is looking for this Father’s Day!